A rock on Mars appears to take the shape of Australia. This image was taken by Navcam: Left B (NAV_LEFT_B) onboard NASA's Mars rover Curiosity on Sol 593 (2014-04-07 13:27:47 UTC). NASA’s Mars rover Curiosity has begun science operations in a new area of study nicknamed “the Kimberly” after the Western Australian region. But in a new image uploaded to the Mars Science Laboratory raw image archive, it seems “the Kimberly” is a little more Australian than mission managers originally thought. As spotted by @CoUdErMaNn on Twitter, Curiosity’s Navcam photographed a rather interesting-looking rock formation just in front of the rover. The rock, which appears to have been formed through some erosion process, will likely fascinate geologists for some time. But at first glance the rock also appears to take the shape of Australia. Of course, this is just another example of Martian pareidolia — a psychological phenomenon that tricks your brain into seeing familiar objects in apparently random shapes — but the similarity is uncanny. This is especially quirky as Curiosity is working in a location named after an Australian region! Curiosity arrived at the Kimberly on Wednesday and the mission is currently studying rocks in the area that may provide further clues to the Red Planet’s past habitability and ancient geology. The location has been eyed by mission scientists for over a year who suspect it will be a science treasure trove. “This is the spot on the map we’ve been headed for, on a little rise that gives us a great view for context imaging of the outcrops at the Kimberley,” said science lead Melissa Rice of the California Institute of Technology, Pasadena, in a NASA Jet Propulsion Laboratory news release. Curiosity will remain at the Kimberly for several weeks scooping samples of regolith and drilling into rocks to access the pristine material below the surface for analysis in the rover’s on board chemistry suite. 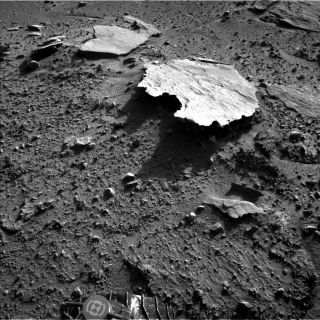 Last year, Curiosity spent months working at the now famous Yellowknife Bay area, scooping and drilling samples. This new campaign at the Kimberly will be the most extensive study since Yellowknife, which provided compelling evidence for an ancient wet and possibly habitable environment for microorganisms to thrive.